As you may know, I am a total cheapskate. I am always looking for a deal or a way around spending money, both in my regular life and my hobby doings. I regularly use this blog advice ways around spending, but here are some purchases that I consider to be totally worth that hard-earned cash. The basic carbide scraper set from Rio Rondo (includes two tips, #1 and #3 from the left) was one of the first “investments” I made for customizing after bodies and paint. I put quotation marks around the word investments because the handle and two bits are only $14.50 plus S/H. I would consider the full set of 6 tips ($54.00) to be a bona-fide investment, but at the time shelling out $20 for a tool seemed like a lot. And worth it’s weight in gold. As Rio Rondo brags, this tool works fabulously for prepping and is safer and more effective than exacto blades or knives. Plus, the pointed tip is invaluable for carving ears and hoof details. I haven’t found the need for the full set, but that original $20.00 was very well spent- I really can’t imagine customizing without it. When I started customizing I used the same brand of epoxy clay as my mother, who uses it occasionally to repair pottery. I don’t remember the exact brand, but it came in two plastic wrapped rectangles, parts A and B. The epoxy itself was nice enough, but I was frustrated because even though I worked hard to keep it in an airtight container, one of the two kinds got all hard and crusty and unusable. It was messy. And it was expensive. When I had finally used all that up (it takes a nice long while when you work with minis!) I looked around for another option. I’d heard other hobbyists say good things about Aves Studio’s Apoxie Sculpt, so I checked out their website. I bought one pound of Apoxie Sculpt (for a reasonable $15.00) and I am very pleased with it. Not only is it excellent to work with (easy to sand, etc.) but it also comes in fabulous, airtight, screw-lid plastic containers, so it’s easy to get out for use and doesn’t dry up! I know there are lots of different epoxy clays out there, but I highly recommend Apoxie Sculpt because it is highly economical. As a side note, Aves Studio offers both colored Apoxie Sculpt and Smoothing Solvents, neither of which I have been inclined to try. I have previously sung the praises of my needle files in this post, but it’s worth repeating. This is a cheap ($8), sustainable tool that will help you with more refined prepping and sculpting tasks. 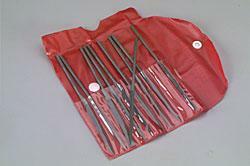 They are excellent for use with ears and leg seams, and unlike sandpaper you don’t have to throw them away. I adore my set of 10 from Hobbylinc (pictured) and use them constantly. Much as I love my carbide scraper and needle files, there are times when a good selection of sandpaper is really useful. Packs of sandpaper are about $3-4 each, but a pack should last you a while if you really use the pieces until they no longer work. I recommend getting fine, semi-fine, and coarse, so that you’re prepared for various prepping needs. A smooth model makes a much better final product. 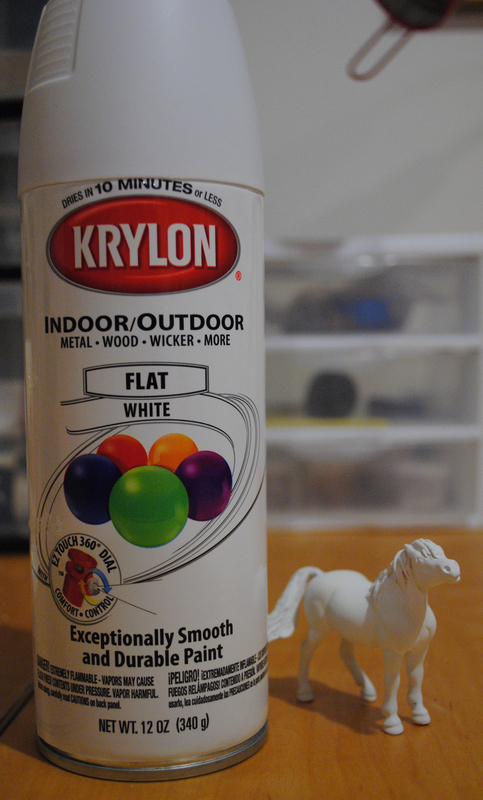 Cheapskate that I am, I used to paint my horses with acrylic gesso before starting the pastelling. Five bucks will buy you a bunch of gesso, but it doesn’t work terribly well for models. Because you paint it onto the horse, it is prone to brush strokes and uneven covering. Plus, it takes a while to make sure you’ve really covered the horse. One day I splurged and bought a spray primer from Krylon. It changed my life (well, my hobby life anyway!) I now firmly believe that spray primer is the way to go. It runs about $5-7 per can and lasts pretty well, although it will certainly cost more than gesso. But it works fabulously. Spray primer coats evenly, completely, and smoothly. It really cuts down on priming time and sanding time. It’s good stuff. A note: when you buy your spray primer, buy a pair of thick rubber gloves. As the primer nicely coats your horse, so will it nicely coat your hand. And primer is not good for your skin. Or two, or three. Especially working with minis (but really, on any scale) you’ll want a teeny tiny paintbrush to really get control over itsy-bitsy details like pupils in the eye or mapping or kissy spots. 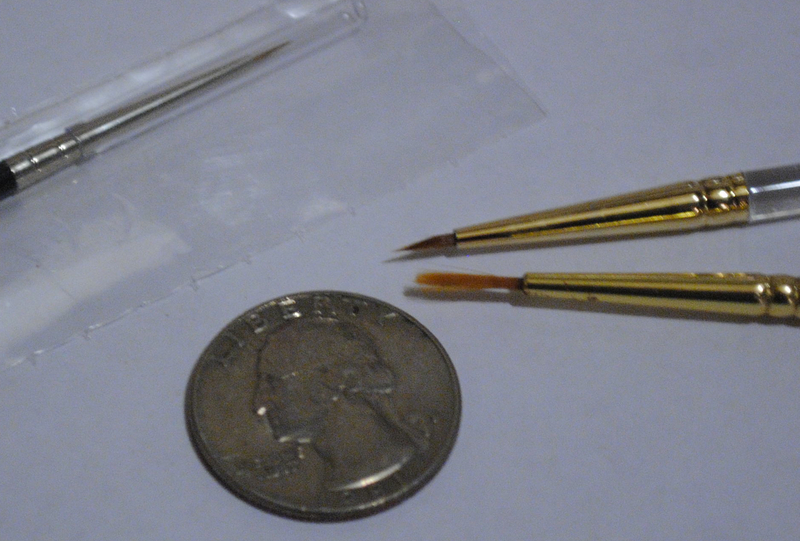 Many artists are willing to spend $10+ per brush for this little pointed ones, but I’m still too cheap for that. The good news is that most stores have cheaper options. It’s still pricy for a paintbrush, at least in my book, but I’ve generally found these small, delicate brushes for about $6 at various local stores. With something as ubiquitous in art as paint brushes, you should be able to find these locally and not have to pay fat shipping fees that this hobby often requires. I’m not the sort of careful person who uses special brush cleaning devices or cleansers, but I do try to protect my investments by taking care of my little brushes. I make sure to clean them thoroughly with cold water after every use (hot water will loosen the glue that holds in the bristles). Also, I save and use the little plastic tube that small brushes come with, which goes over the bristle and protects them from getting squashed. This way, my $6 brush lasts me a good long time. 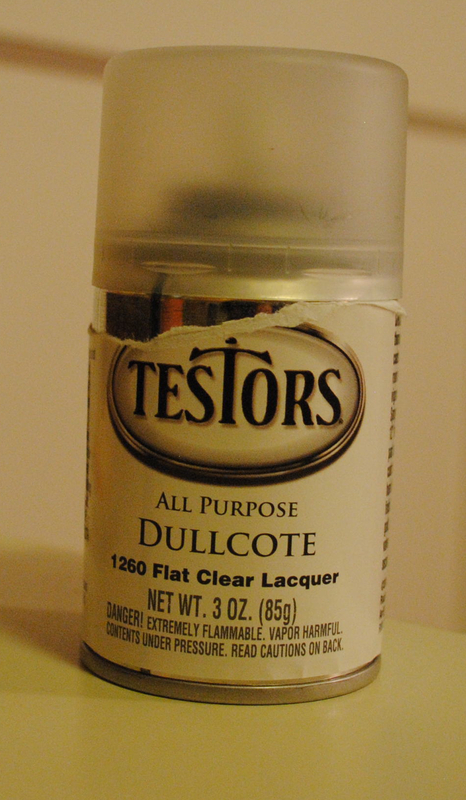 If you haunt hobby message boards or list serves like me, you have surely heard of Testor’s Dull Cote. It’s a great matte fixative, but the only problem is that it is not readily available locally for many hobbyists. When I was in college in a small town I could not find Dull Cote, and, refusing to pay shipping to order it online, I made do with Krylon Workable Fixative/Krystal Clear and Krylon Matte Finish. If you can’t get Dull Cote, Krylon works fine. But to get the best matte finish and the best “tooth” for the next layer of pastels, you really do have to use both kinds every time you fixative a layer- first the Workable Fixitive/Krystal Clear to fix the work you’ve done, and then the Matte Finish to keep the horse matte and to provide tooth (It may work fine to just use Matte Finish, but I always say the combo recommended and followed that advice). Even with the use of Matte Finish, these models often looked glossier than I wanted and I would end up doing multiple coats of Matte Finish at the end to get the shine down. The great thing about Dull Cote, which I found at a hobby store here in Portland, is that it it very matte and has great tooth- better than the Krylon combo by far. This means that each layer of pastels provides a nice strong addition of color. For the cheapskate in me, Dull Cote is a nice option because I am buying one can rather than two, although a can of Dull Cote is pretty small. Now that I have experienced the Dull Cote magic for myself I might even be inclined to buy it online if I couldn’t find it locally. It just might be worth it. After all, the right fixative is pretty crucial to each custom and makes all your hard work worthwhile, satisfying and successful. So yes, I am jumping on the hobby bandwagon in support of Testor’s Dull Cote. Those are my crucial studio purchases. What do you consider essential to customizing and collecting? This entry was posted in Tips, Tricks, and Tutorials and tagged customizing, fixative, prepping, sculpting, studio, tips & tricks, tools. Bookmark the permalink. A comment relating to sandpaper: I have found that on small scales like SM scale, when you are doing white markings and you get the paint a little thick, or there are thicker layers around the edge, normal coloured card works really well for just smoothing it out (once dry). I prefer to use white, as I am worried the coloured ones may leave some colour, but nevertheless it has proven very useful. Great for when you don’t want to go in with the sandpaper for fear of taking off too much paint.